People around the world have been drinking more coffee over the past 20 years, but the boom isn’t paying off for coffee bean farmers in poorer nations along the equator. New research finds that the shift to “technified” coffee production in the 1970s and 1980s has created harsher economic and ecological consequences for heavy coffee-producing nations, such as Honduras, Colombia, Guatemala, Brazil, Vietnam, and Ethiopia. “Historically, coffee has been exploited by the West in various ways because it’s consumed in rich countries and grown in poor ones” says Alexander Myers, doctoral candidate in sociology at the University of Kansas. The paper examines how the shift to technified coffee for mass production and to meet greater demand hurt peasant farmers of those countries and had a major ecological influence there, especially with the amount of water required for the crops. Myers says the shift to technified coffee production changed the process to look more like traditional large wheat or soybean farms in the United States as opposed to allowing coffee plants to grow in smaller shaded areas. The latter process used much less water, for example, and it allowed farmers to diversify their crops and use their land to plant other crops as well. Technified production requires farmers to exclusively grow coffee. 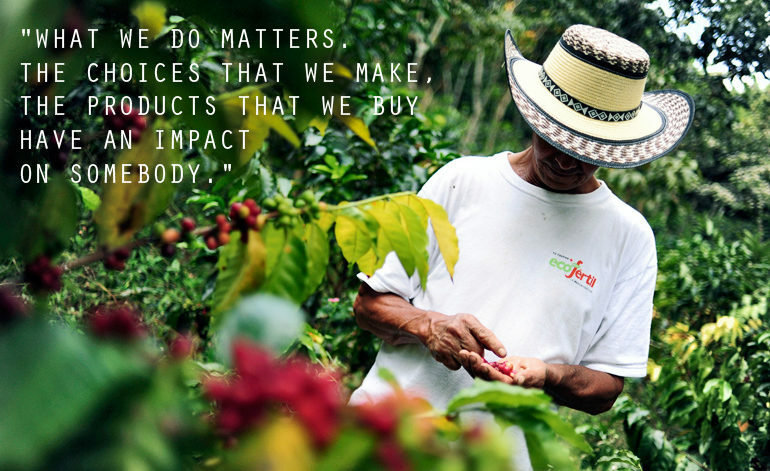 “Especially these peasant farmers who maybe have a small plot of land, they rely almost exclusively on coffee sales to sustain themselves,” Myers says. Major drops in commodities prices of coffee beans to around 50 cents per pound in 2001 nearly wiped out economies of those nations, for example. “That really hit the farmers hard, and it caused a lot of these family farms that have historically relied on coffee to keep themselves afloat,” Myers says. The technification of coffee production also required a new type of coffee bean to grow effectively, but the process also required much more water to produce. Some ecological researchers have estimated the average cup of coffee takes 140 liters (37 gallons) of water to grow. “It’s very taxing environmentally,” Myers says. The fair trade movement in the past two decades has helped somewhat to offset somewhat both the economic and ecological changes, especially for poorer farmers in developing countries. Myers says these movements could help raise awareness, especially among coffee drinkers in Western nations. Myers will present his study this week at the American Sociological Association’s annual meeting in Chicago.